Do you battle with the removal of persistent stains, water streaks and grime build-ups from your windows? Do they cost you too much effort and you have no will to take part in this household task? This task will no longer consume a lot of your time and energy! The experts of window cleaning in East Finchley are willing to render you assistance! You will be able to use your leisure time as it fits you – the skilled and dependable professionals will deal with the sweeping and scrubbing. We provide impeccable cleaning services for all kinds of windows. Read further and discover more about the different perks you can get. We also provide our professional services in nearby areas: Fortis Green, Hampstead Garden Suburb, Maida Vale, Dartmouth Park, Hornsey Lane. You can always depend on our workmanship and devotion for domestic and commercial window cleaning. Our abilities allow us to clean all kinds of windows you could possibly have at your property. For example, you can book cleaning of small or double windows, sash ones, French doors, patio doors and bay windows. In addition, we include conservatories and roof windows as part of our process. So to speak, you can enjoy the good look of your windows with our timely and trustworthy services. The professionals of window cleaning use advanced methods for the procedure of scrubbing and polishing your glass surfaces, roof windows and greenhouses. Our water-fed extension pole technique allows us to reach up to the fourth floor. The pole is connected to a water reservoir in the van, removing the risk of damage to the exterior of your property. We also use jet washing as part of our window cleaning routine. You can also take advantage of these effective routines. You can be certain that the great look of your business property is guaranteed. 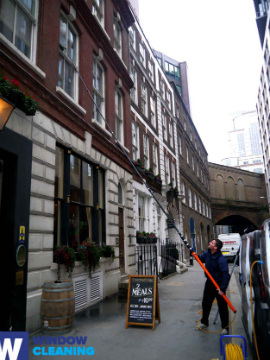 The experts will will fulfil your need of second-to-none commercial window cleaning. With the help of our water-fed extension pole equipment, you will receive fast and excellent cleaning of all windows up to the fourth floor. For buildings higher than that, we put to use our rope access equipment. It is our efficient way of reaching glass panes on taller structures. It doesn't matter what is the size of your property – a humble corner shop or the Shard – we will guarantee perfect look of your windows. Benefit with our quick and professional domestic window cleaning in East Finchley. We can clean the windows of your property inside and out. The products we use are eco-friendly - you will love the perfect results and make a green choice. Moreover, we use only purified water. Don't wait, call 020 3746 3113 and order our first-rate services. Our customer service agents will assist you – they are on-call 24/7. Another ways of booking – our request a cleaner online form or just chat with our operators.